Congratulations Ernie & Luke on a fantastic job. Further to LTBs 688/18 and 689/18 dated 10thDecember. In view of the members’ decision above, I have written to the Post Office to formally withdraw the notice for industrial action on Christmas Eve afternoon. I have also written to members’ home addresses to inform them of the ballot result and to advise that the strike notice has been withdrawn as a consequence of the Agreement being ratified. All arrangements for resourcing Christmas Eve afternoon will be made in accordance with the Guiding Principles integral to our Agreement. In the unlikely event of members experiencing any issues in this regard, they must contact their Representative as a priority. Additionally, the £100 compensation payment for both full-time and part-time members will now be made with the January salaries. I am pleased we were able, with the support of Dave Prince, Chief Conciliator, Acas, to find a mutually agreeable way forward which our members have endorsed to resolve this dispute. If you have any questions in relation to this LTB, please contact Lea Sheridan – lsheridan@cwu.org. Further to LTB 652/18 dated 16th November. I wish to provide Branches with an update specifically regarding TUPE. Yesterday we held the first joint meeting with the Post Office and WHSmith in regard to TUPE consultation. This activity took place despite WHSmith initially refusing to engage with the Union. Due to the serious issues under consideration, our negotiating team was supported by Ivan Walker, our legal expert. This was necessary as both Post Office and WHSmith also had their in-house solicitors in the room. “We are pleased to report that a meeting was held on Thursday 20th December between Post Office, WHSmith, CWU and Unite. The purpose of this meeting was to discuss the TUPE arrangements in regard to Terms & Conditions for employees transferring to WHSmith as a result of the franchising plans. The meeting was both constructive and cordial, with all parties now having a clearer understanding of the issues under consideration. There are a number of key areas that require further examination from the various parties, and subsequent discussion. I appreciate the above is light on detail. Unfortunately the nature of discussions surrounding TUPE is exceptionally complex. Consequently there are a number of key areas which have been discussed in detail that require further analysis and research from various participants in the talks. At least we are now in a serious conversation with WHSmith and we are, as a consequence of the first meeting, hopeful that good progress can continue to be made. Our clear aspiration is to bring these matters to a successful conclusion at the earliest opportunity in order that members can make informed decisions about their future. Further developments will be reported. Following Royal Mail Group’s recent announcement concerning the new Operations structure, the CWU have now been advised of the revised Area structure that will come into effect from April 2019. The areas listed below will report directly to one of the three Service Delivery Directors. Attached to this LTB are details on how the existing Operation Managers and Plants will align to the aforementioned Area structure. Further information will be shared with Branches in due course, in the meantime, any enquiries in relation to the content of this LTB should be addressed to the DGS(P) Department. Peterborough Trades Union Council will be showing the documentary film, The Nature of the Beast, about the life of Dennis Skinner, on Friday, 1st February, 2019, at The John Clare Theatre, Peterborough Library. Doors open at 7pm. This really is not to be missed, so get the date in your diary now. MORE INFO COMING SOON! Christmas Special of the CWU podcast U Word. Please have a listen to the Christmas Special of our podcast U Word. We review the year, look forward to 2019 and have a little fun. The next issue of The Voice will be landing with our members during the festive period. 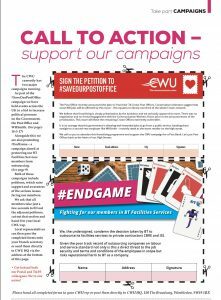 As part of our strategy to use our publications to promote key campaigns we have included copies of the Save Our Post Office and #EndGame campaign petitions on page 3 of the magazine. The aim of this feature is to get as many members as possible to support our campaigns. To ensure we receive the highest possible level of returns we ask you to bring this to the attention of all CWU representatives so they are able to encourage members to return petitions either directly to CWU HQ or via their local Branch. A copy of the relevant page of The Voice is attached for information. It would also be appreciated if this information could be shared via social media, WhatsApp or Email. Branches will be aware that Unionline is jointly owned by CWU and GMB and as such it is important that in considering the report we take fully into account the need to protect the commercial interests of CWU and our sister union the GMB. Therefore, at this point it is not appropriate for the report to be available in the public domain. Furthermore, given the comprehensive nature of the report and its findings, we will now need to engage in a series of detailed discussions prior to me placing a document to the NEC with recommendations on how we move Unionline forward. This is a major piece of work and it will not be finalised until end of January/February 2019. Once this work has been completed, we will be making appropriate arrangements for Branches to be fully updated on the report. Further information will be sent to Branches in due course. Any enquiries on the content of this the General Secretary ongsoffice@cwu.org.